do if he is to match the pace of his rivals, lead by his team mate, Marc Marquez. 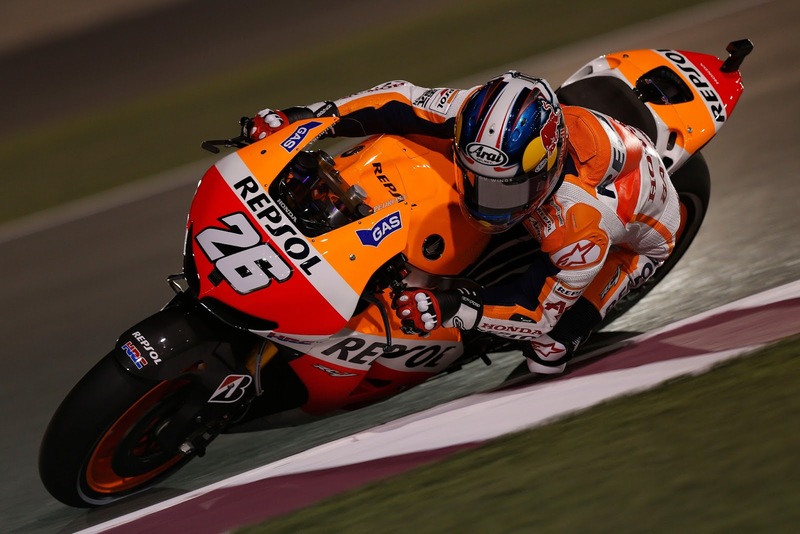 Pedrosa finished the combined qualifying times in 6th place, but under half a second behind his team mate in first place. This is a significant improvement, after FP2 the Spaniard was over a second off the pace. Pedrosa has been having issues with corner entry on his RC213V, although he claims it is now getting better: “We improved a little today and are now further up the order. We are faster and entering corners better, but we’ve still got a way to go. We hope to gain a little rear grip, which would allow us to ride more comfortably. The times keep dropping with every session, but we are going to try to keep getting better and prepare for qualifying and the race. The track isn’t in good condition this year and I don’t think that this will change; maybe it will improve slightly as more laps are completed. However, this doesn’t mean making any big changes to the bike – just improving the setup for the conditions we have”. Wonderkid Marc Marquez stormed to the top of all of today’s practice sessions and the combined times with a 1’56.085, just a thousandth faster than Yamaha’s Jorge Lorenzo. Despite the fast time Marquez recognises he needs to find more consistency in tomorrow’s 30 minute practice prior to the qualification shoot out: “Practice today went pretty well – better than expected. I was very comfortable on the bike, and this is the important thing. Our foundation isn’t bad at all, we are improving in every session and working with Sunday’s race in mind. What we are missing is a bit of pace and consistency. We will have to make the most of the 30 minutes that we have before qualifying tomorrow to improve those points”.